Confederate States of America. Post-Office Dept Instructions to Post Masters. Richmond, Va.: Printed by Ritchie & Dunnavant, 1861. Postal rates -- Confederate States of America. Postal service -- Confederate States of America. Postal service -- Law and legislation -- Confederate States of America. 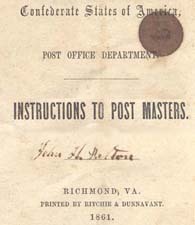 Postmasters -- Confederate States of America.